Ole Scheeren's Vancouver skyscraper will offer a "new typology for vertical living"
Architect Ole Scheeren has unveiled his first solo project outside of Asia – a Vancouver skyscraper that will feature a series of offset apartments protruding from the facade in a cluster of irregularly stacked glass boxes (+ slideshow). 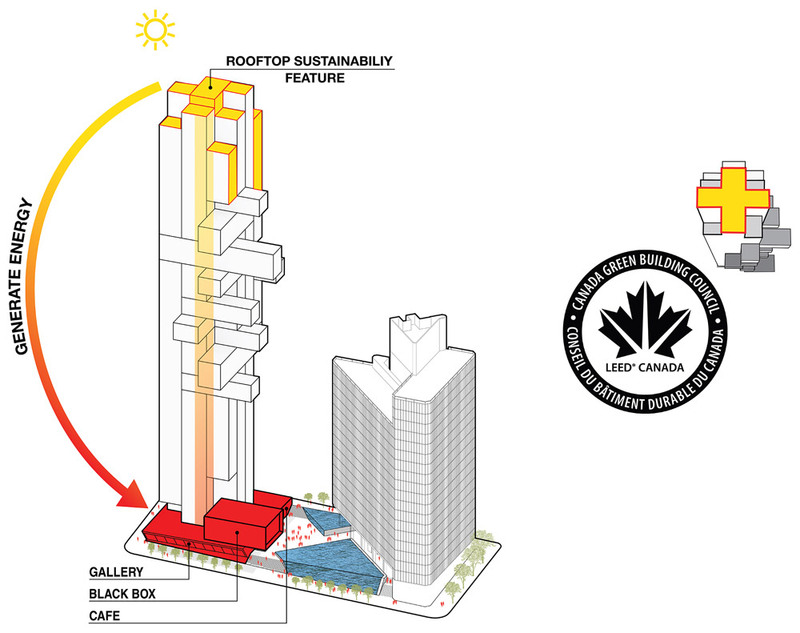 Proposed for 1500 West Georgia Street in one of Canada's most densely populated cities, the skyscraper is described by Bruo Ole Scheeren as a "new typology for vertical living in Vancouver". Its form, with multiple cuboid projections piled on top of each other, reflects the irregular arrangement of the living spaces inside, making the project the latest in a series that use this stacked-box approach. Earlier this week Danish firm BIG unveiled its stacked design for its World Trade Centre Tower, and other examples include SANAA's New Museum of Contemporary Art in New York, which was completed in 2007. Rather than creating an entirely stacked form, Scheeren's glass skyscraper has protrusions concentrated on one side. The roofline of the structure is also a cluster of cubes. 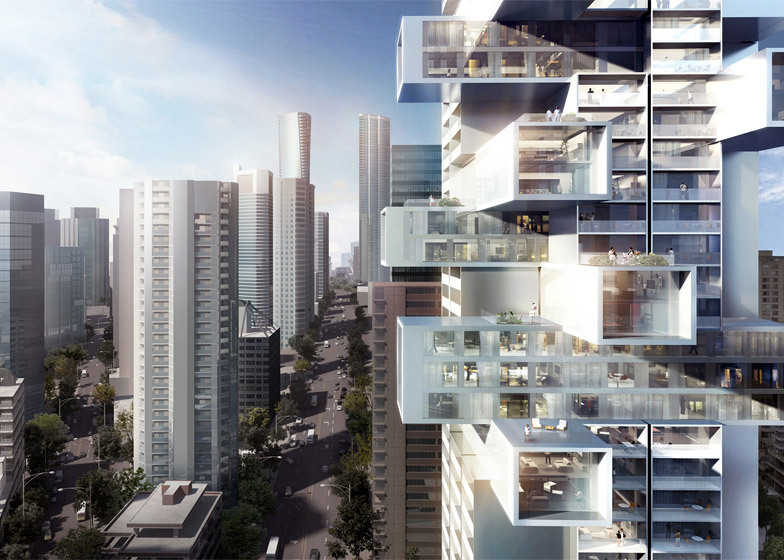 "A system of vertically shifted apartment modules enables dynamic yet rational and efficient layouts for residential units, while the horizontal rotation of these modular elements projects living spaces outwards to introduce the concept of horizontal living in a slender high-rise," said a statement from Buro Ole Scheeren. "The resulting multiple terraces generated from these horizontal shifts create both physical and emotional connectivity between the indoor and outdoor environment." The building will include 48 floors of residential space housing 235 apartments, above two floors of mixed-use space at ground level. Six basement levels will house parking space, bringing the total size of the building to 30,200 square metres. It is designed to act as a beacon for the entrance to Vancouver's centre from the North Shore and Stanley Park, at the point where the city's urban grid begins to widen out. 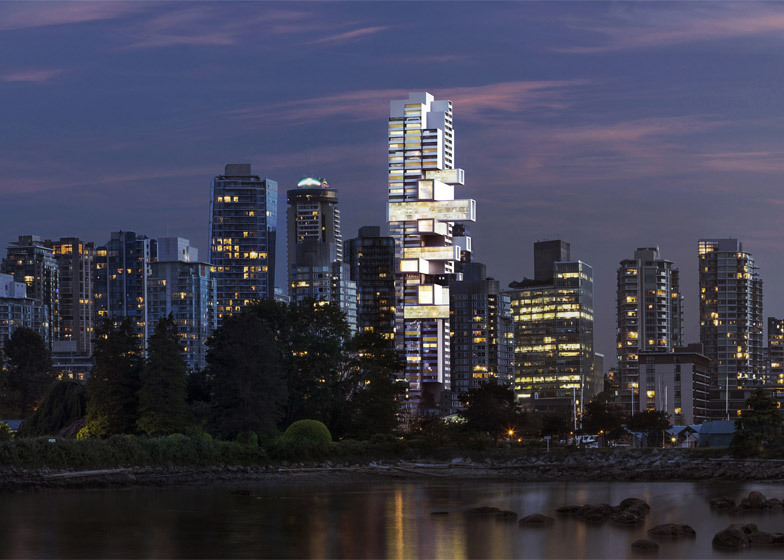 "Like many cities today, [Vancouver's] skyline is dominated by verticality – extrusions of generic towers that don't engage their environment and create isolation rather than connection," said the firm. "Ole Scheeren's design opens up the inert shaft of the tower to embrace both city and nature in a three-dimensional sculpture which projects the space of living outwards into the surrounding context." By offsetting the living spaces further up the building, the design aims to create the maximum living space while maintaining a small footprint at ground level to make way for a new public plaza. 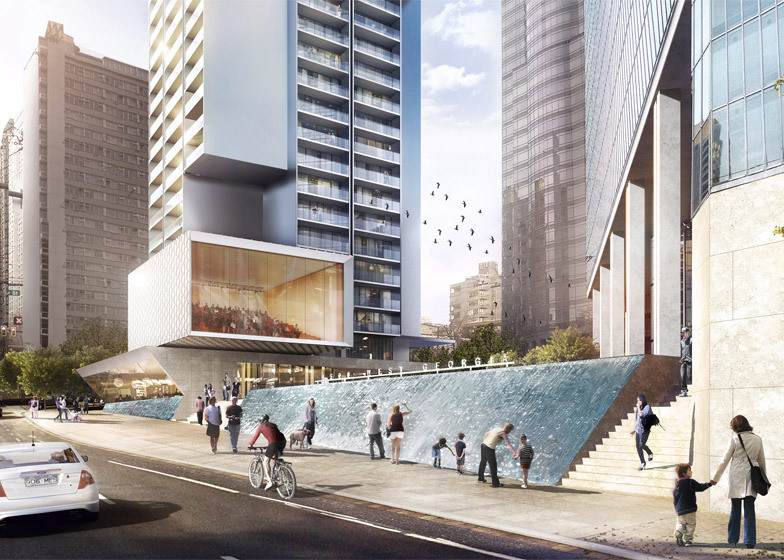 "An amplified reinterpretation of the existing water cascade along West Georgia builds on the strong architectural heritage of the site, while multiple crossing paths ensure urban permeability," said the firm. 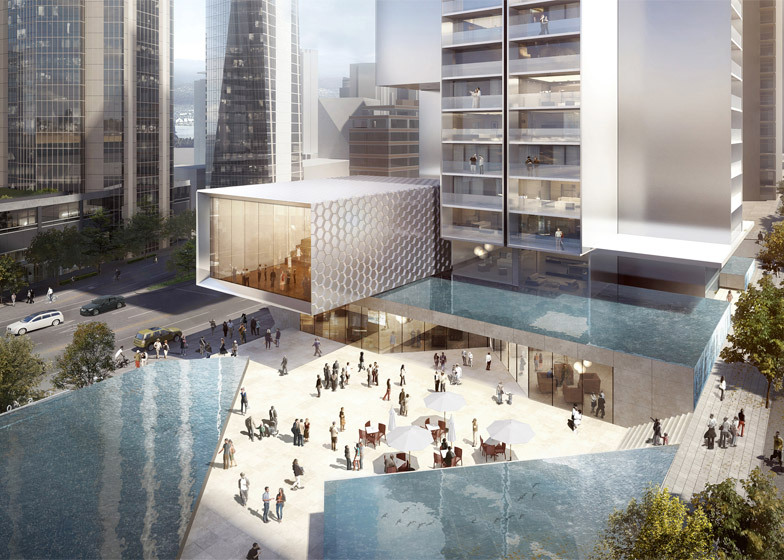 The building will replace an existing retail pavilion and landscaping next to another 20-storey office block – the wedge-shaped Crown Life building from 1977, originally designed by local architecture firm Rhone and Iredale. The block is owned by the project's developer Bosa Properties, who says it will be integrated into the new design. Construction dates have not yet been confirmed. Scheeren founded his Beijing-based studio after leaving Dutch firm OMA, where he was the partner in charge of projects in Asia. He recently revealed plans for a combined auction house and museum beside Beijing's Forbidden City, and completed The Interlace in Singapore – a prototype housing development where horizontal buildings are stacked diagonally across one another to frame terraces, gardens and plazas.